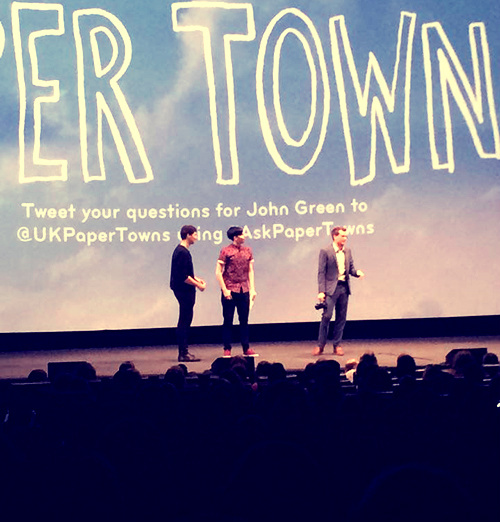 This weekend I was lucky enough to attend the official UK Paper Towns movie Q&A in London’s Leicester Square. The event was advertised as a Q&A with author John Green, along with a few surprises. As John Green is one of my favourite novelists – having also written both The Fault in Our Stars and Looking for Alaska, both of which are favourite books of mine- I was very excited to be able to witness him answering questions regarding his book Paper Towns and it’s film adaptation, along with whatever else the evening had in store. As I made my way into the extravagant Leicester Square cinema - which has hosted many a blockbuster film premier – I was pleasantly surprised to find that the seats were lined with complimentary copies of The Fault in Our Stars, along with free bottles of water. As soon as the event began the first surprise of the night was immediately unveiled; Youtube duo Dan and Phil were to be hosting the Q&A (it took me about 15 minutes to recover from this as they are my favourite Youtubers). Within minutes they introduced John Green himself to the stage, who then announced that to start the evening we would be privy to an exclusive 20 minute clip of the film. Now, Paper Towns is not my favourite John Green novel, but nonetheless I’d been anticipating what the film adaptation had in store since it was announced. So being about to watch 20 minutes of the film – which turned out to be one of the most pivotal parts of the story – I was finally about to find out. And I was far from disappointed. All John Green fans will remember with fondness the segment near the start of Paper Towns the novel where Margo climbs in through Q’s window, and the rest of the events that unfold that night. And whilst watching those very scenes play out it was clear that a better job in adapting them onto the big screen couldn’t have been done. Nat Wolff (who also appears in the movie adaptation of The Fault in Our Stars) and model turn actress Cara Delevingne make perfect sense in their respective roles as the awkward, love-struck teen and the unattainable and destructive high school love interest. The scenes played out almost exactly how I had envisioned them in my head when originally reading the book, but now with entrancing cinematography and a poignant soundtrack to boot. And as the screen turned to black the clip was met with a wild applause as John Green, Dan and Phil made their way back on stage, now ready for the Q&A segment to begin. The Q&A consisted of Dan and Phil reading out pre-selected questions from Twitter users and audience members alike, and rallying them to John Green. Green delivered his answers with humbleness and humour throughout, whilst also offering substantial insight into both his writing process and his thoughts on the film. He provided in-depth answers to each question, revealing the thought process behind his storytelling style, the significance of the entomology behind his character names, and disclosing the scenes in the film he’s most excited for audiences to see come to life (the 20 minute clip the audience had just seen being one of them), and much more. When asked about why he had wanted Nat Wolff to play the role of Q, Green took the opportunity to introduce Nat Wolff himself to the stage to give his own input - his unexpected appearance getting the biggest cheer of the night. Cara Delevingne also surprised the audience (and John Green himself) by joining the stage for the last 10 minutes of the Q&A. Both cast members added their own thoughts and observations on the story and their characters; Nat revealed that Paper Towns was by far his favourite John Green novel, while Cara expressed the desire to both befriend and have a go at her own character, Margo. I left the cinema feeling privileged at having the chance to be in the same room as one of my favourite writers and two of my favourite entertainers, and also to be able to learn more about the Paper Towns movie straight from the leading cast members themselves. I now eagerly await being able to watch the film in its entirety when it reaches UK cinemas, and to see yet another one of John Green’s imaginings come to life on the big screen. Paper Town will hit cinemas on the 21st of August in the UK, and the 31st of July in the US. Looking for Alaska is now going to be a movie too which is great :) And I actually read spoilers for the ending of The Fault in Our Stars about a week before I read it, so I feel your pain! I'm was definitely so lucky! I'm really excited to see the movie - I think Cara is going to be brilliant in it. I'm only half way through the book and need to finish it before it's released next week!